RepairQ is a Customer Relationship Manager built uniquely for the repair industry. Managing your customer relationships is essential to any service business. 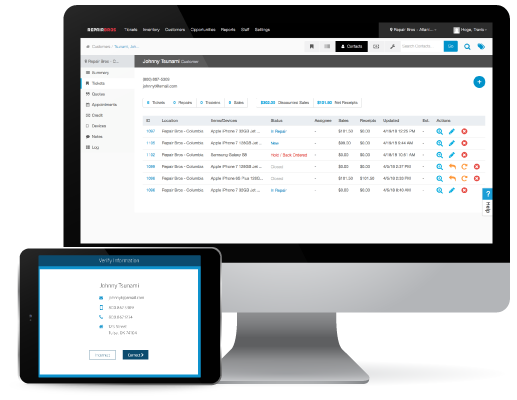 RepairQ offers powerful tools to manage your consumers and corporate accounts with visibility into contacts, sales history, equipment, opportunities, and more. Give your customers an exceptional experience during check-in and checkout using RepairQ’s tablet app, Qpop. With Qpop, you have a dedicated visual presentation that supports your customer counter experience. Provide your customers with an online portal to check on their tickets. Qsite can provide your customers a brief summary of their open tickets including the current status, balance due, last updated time, and notes. RepairQ’s CRM communication automation tools make it easy to build and manage emails and text messages that are delivered to your customers based on the rules you define.